One can find out the stresses for the rectangular, circular or strip loading using the boussinesq's equation, but Newmark's influence charts were prepared to calculate the stress below an irregular shaped uniformly loaded areas. In such cases, these charts are extremely useful. Newmark's charts are based on the vertical stress at a point P below the center of a circular uniformly loaded area. 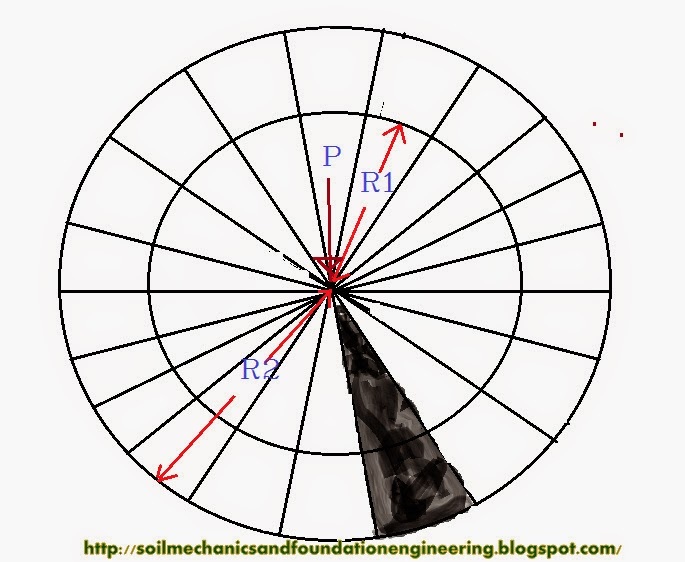 Consider a circle of radius R1, divided into 20 equal sectors. The vertical stress at a point below the center of the circle at depth z due to a uniform load on one sector will be equal to 1/20th of that due to the load on the entire circle. Thus every twentieth sector of the circle, with radius R1 equal to 0.270.z would produce a stress of 0.005.q at a depth z from its center. Now consider the second concentric circle with radius R2, in this circle, suppose the area of the strip excluding the area under the strip of radius R1, produces a stress at point P, equal to 0.005.q, then the total stress at P would be equal to 2*0.005.q. Putting these values in above equation, R2/z = 0.40, In other words, the radius of the second circle, should be equal to 0.40.q. Similarly, the values of the Radii of 3rd to 9th circle can be determined. The values are 0.60.z, 0.77.z, 0.92.z, 1.11.z, 1.39.z and 1.91.z. The radii of 9.5th circle is 2.54.z. The radii for the 10th circle when calculated comes to infinity. Therefore the 10th circle can not be drawn. Remember each enclosed area in between the different circles and the sector lines has an influence of 0.005.q. There are 20 sectors and 9 circles, and thus the Newmark's influence chart is ready. Measure the depth z and precisely locate the point P where the stress is to be determined. Plot the plan of the loaded area with a scale of z equal to unit length of the chart (AB). Place the plan on the chart in such a manner that the point P, at which the stress is to be determined is placed directly below the center of the chart. Count the number of elements(M) of the chart enclosed by the plan of the loaded area. q = pressure intensity at top. M = Number of elements of the chart covered by the prepared plan. Reference: Buy this book online from Amazon. Titled 'Soil Mechanics and Foundation Engineering' by Dr. K R Arora.